When we see art posted on the blogs from our community, by far the majority of times it is a cropped picture of a particular piece. We don't often get to see pictures of the art in the space where we actually live. Hanging art. Art on the walls. Art over the couch. Art leaning on the bookcase shelves. Living with Art is about showing and seeing art in real life settings. Every Thursday I will be posting a series of images shared by creatives showing all of us just how art is displayed in their spaces. Each participant is opening the door and inviting us all into their surroundings. Please contact the artist if you would like any information about the pieces on display. If you want to share yours, simply email me an image, a few lines about your artistic aesthetic, and a link to your own online site. Now sit back, relax and enjoy the show. It makes me feel happy and lively to surround myself with objects and substrates that can be changed on a whim, my whim, by me. I have that split personality when it comes to my home, well when it comes to other spaces too. On the one hand I am drawn to south of the border or middle eastern colors, patterns, and feel, as I'd like to create the "Red Tent" in my home and on the other, Wabi Sabi aesthetics, worn out indigos, blacks, slates, rust, and skulls really make me dance inside, soulful dances. What a girl to do? Have both! 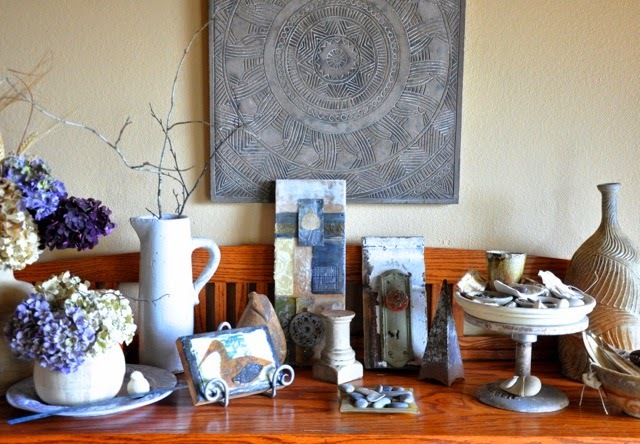 My arrangement here speaks of my love for old and new, for handmade and nature made objects. When I walk by, I have to touch and examine... a seashell, a waterworn stone, a seedpod. Time. memories, my world are all in front of me to know, to love. 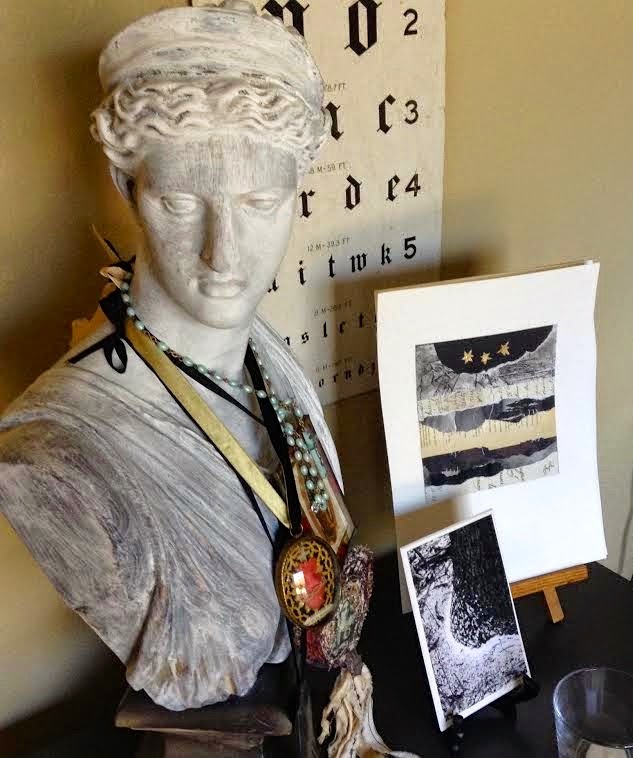 My studio art vignette gathers a combination of works purchased from artists that inspire me, antiques, works created by my children and a somewhat rotating group of my work that come and go from galleries. I decorate a lot with with my artwork and hope to do more. I made the hanging bells out of yogurt cups. It is difficult to tell but they are crackled to within an inch of their life. The inside is turquoise like the crack in the bell. And the clacker is a ball with a face on it. Anything made by me, on my walls, is because, for me it has reached a level which, I feel, shows a satisfactory accomplishment. It gives me pleasure to think "I made that", others may see it as showing off! This particular set of art spaces has made me smack my head. 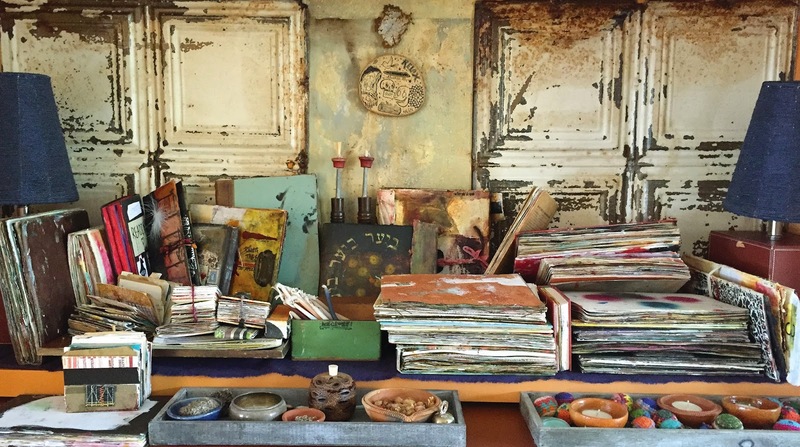 I definitely relate to it all and I think it is time to make more space for my own art! Thanks SO much, Seth! OH my goodness... I'm feeling so inspired. Thank you for sharing! Your home and art are lovely. Just wonderful... and thank you! These glimpses are all beautiful, and so inspiring! Thanks! I really enjoyed this piece and especially these spaces shown here, I can see how living with your art can create the "feeling" of art in us. I'm thinking I need to re-decorate!! Thanks for the post, will be looking forward to Thursdays. I remain amazed, Seth. Breath-taking art IRL. Thank you--and the other--for sharing. You have done it again, inspired us all with your vision, giving us a chance share and by sharing you have connected us all. Thank you. oh...this is the best, how I love peeking into windows to see how people live with their wonderful objects. Thanks for the views. Fun to see the spaces where art is made and appreciated. Thank you to all who share their art spaces and thank you Seth, for putting this together- lovely! Great post idea! Would love to see more. 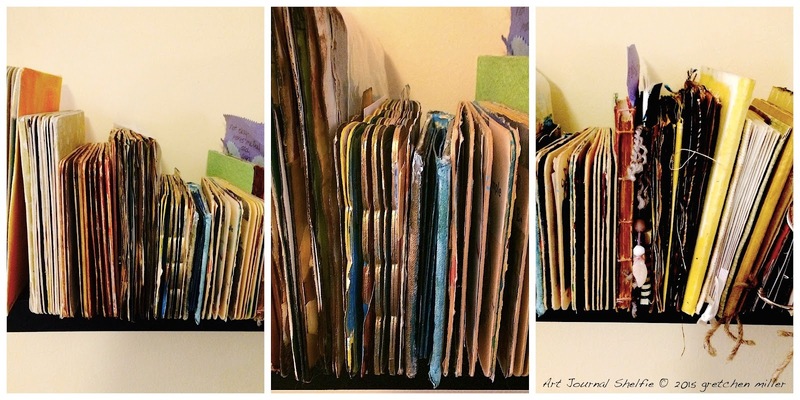 This has been such a great post...seeing how others live with their art...thanks for putting this together! This is a great service, Seth. I love these photos. This to me is the essence of what art is for/about. It's about living among art and expressing through art and experiencing life through art. Art commerce and social media are good venues as well, but to be surrounded and creating, even if only for yourself, is what art has become for me.